On Shabbos, parshas Nosso, Sivan 11 (June 1), we were privileged to enjoy an additional farbrengen. This was an extremely freilicher farbrengen. It is the first time I have ever seen or heard the bochurim singing so vigorously non-stop without any prompting by the Rebbe. I like to think this was due to my talk at the kinus hatorah. One sicha pertained to Pirkei Avos, the first chapter of which we study on the Shabbos after Shavuos. In mishna 12 Hillel says, “Be like a student of Aaron, love peace, pursue peace, love your fellow creatures and draw them close to Torah.” This is written in Hebrew. The language of the commoner, the man in the street, in Babylon, where Hillel was from, was Aramaic. Should not have all three statements been made in Aramaic, his local language? In looking at the first mishna, in Hebrew, we find that it contains instructions directed specifically to learned people. These teachers of the Torah and leaders should reach out with love and bring people closer to the Torah. It would have been undiplomatic and in bad taste to record this mishna in Aramaic, open to the common man, implying that they were ignorant or in need of attention to come close to Torah. This saying, therefore, was made in Hebrew. “A name made great is a name destroyed… who makes worldly use of the Crown of Torah shall pass away,” in Aramaic, is a dire warning to the masses: be wary of any leader who takes advantage of his Torah learning and knowledge to put himself above everyone else. Do not accord such a person honor. “A name made great,” someone seeking power and fame, is a person in danger of falling prey to “a name destroyed,” or even worse, “shall pass away.” This statement is in Aramaic so that the “common man” would understand the problem and perils of honoring such a person and take the appropriate action. The third mishna is directed solely toward the leaders: “If not now, when?” cautions Hillel, do not waste precious time pursuing fame. Regardless of fame, do it now; there is no time like the present to bring less fortunate people closer to G‑d. This, again, was written in Hebrew, so the less educated people would not understand it. 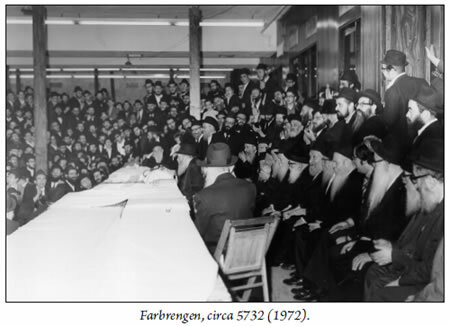 Before the end of the farbrengen, the Rebbe summoned me to the head table (“Mr. Manchester,” he called out) to give me a bottle of mashke (vodka) to distribute in Lubavitch of Manchester. Others who also received bottles: the Deputy Mayor of Jerusalem, Shmuel Shaulson; Rabbi Aaron Dov Sufrin for London; Rabbi Schlamme from France and representatives from Kfar Chabad, Israel. Zalmon Jaffe, of blessed memory, a businessman from Manchester, England, gives a unique look at what transpired in Lubavitch World Headquarters and his interactions with the Rebbe, Rabbi Menachem Mendel Schneerson, of righteous memory. His diary was published in a series entitled: “My Encounter with the Rebbe.” Excerpts are reprinted here with the permission of the Jaffe family, Manchester, UK. Published by PCL Publishing Brooklyn, NY. To learn more about My Encounter with the Rebbe visit: myencounter.com.